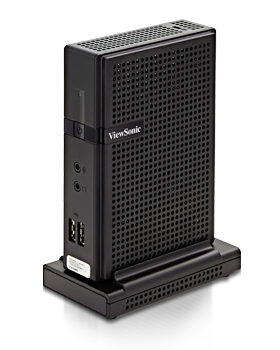 The ViewSonic® SC-T46 Thin Client PC uses the powerful Intel N2930 1.8GHz CPU, with Windows 8 Embedded Standard or Linux OS. The SC-T46 is optimized for all the major remote networking protocols including Citrix ICA/HDX, PCoIP, and Microsoft RemoteFX—making it a versatile virtualization solution with endless possibilities. The SC-T46 has the horsepower needed to handle a large portion of local processing and graphics rendering, and the flexibility to operate as a stateless device in a VDI-based infrastructure. Also, the SC-T46 allows to simultaneously save energy and space, thanks to its low consumption rate (only 14w) and to the VESA-ready feature (easily mounted by simply applying the brackets provided). The SC-T46 Thin Client provides the benefits of a PC-like performance, along with simplified management and lower TCO. ViewSonic’s Thin Clients represent the smart solution for an optimized virtual desktop deployment.